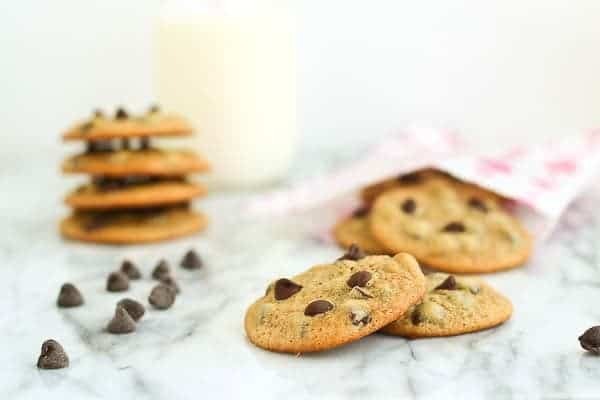 Malted chocolate chip cookies are pretty darn irresistible. Grab a glass of milk and go to town! My husband loves chocolate chip cookies. I think he actually gets a little annoyed when I make different types of cookies. Okay but here’s the problem with this scenario… I’m a food blogger. So here’s my solution: I keep a bag of frozen whole wheat chocolate chip cookie dough balls in the freezer so that he can pop a couple in the oven whenever he wants them. He can even make them in the toaster oven. Sometimes I sneak one and eat it raw. Don’t tell my mom. So since the freezer is stocked for him (because I’m the best wife ever, naturally), I can experiment a little with new and fun flavor combinations. I love these lemon clementine crinkle cookies, but they’d be way too weird for my husband. This time I must not have had dough stocked in the freezer because I didn’t stray too far from his favorite. That’s my other trick, beyond the frozen dough. Try to change things up just a leeeeeeetle bit and hope that he won’t notice. It usually doesn’t work, but I give it my best shot nonetheless. To try to pull a fast one on him this time, I went for a subtle malt flavor in these cookies. 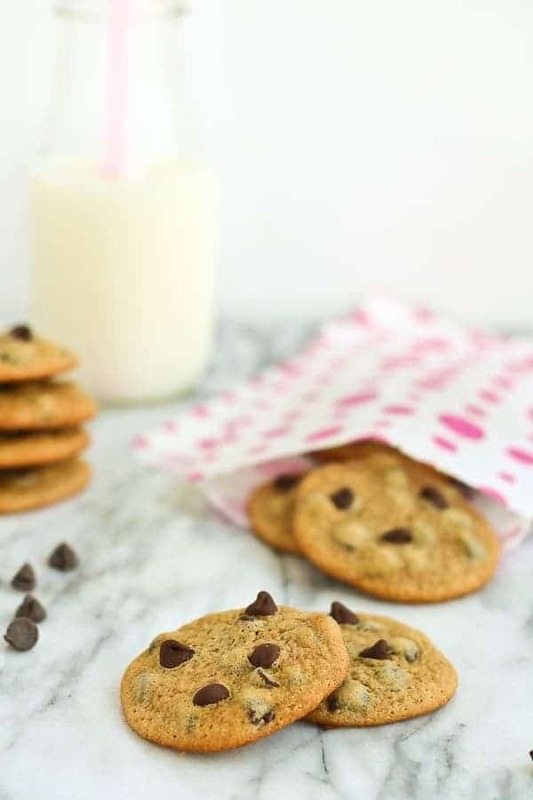 I adore drinking a chocolate malted milkshake so I wanted to bring that malted milk flavor into the classic chocolate chip cookies. I love the combination of the malt flavor with the chocolate. 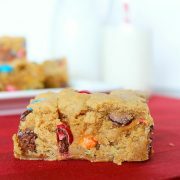 It’s a match made in cookie heaven. It’s a match made in milkshake heaven too, but that’s a different conversation for a different day. 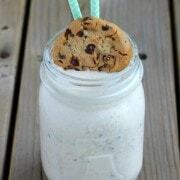 Unless you can have both the cookie and the milkshake. Then do that. Definitely do that. 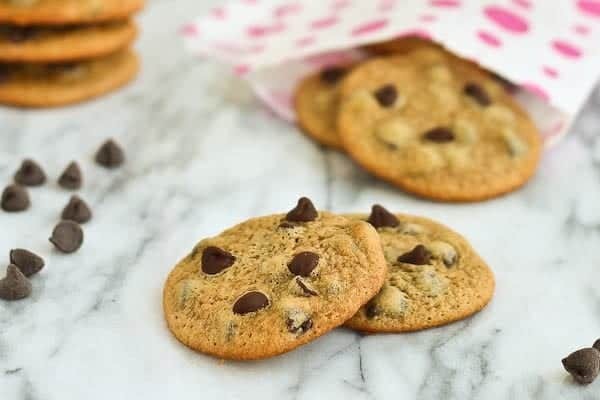 I love a flatter, chewy cookie but if you like a thicker cookie, you can increase the flour content slightly – try 1/2 cup more flour for a thicker cookie. If you’re looking to go a different route entirely, try these insanely easy Cool Whip cookies! 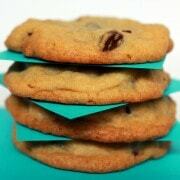 This Malted Chocolate Chip Cookies recipe was originally developed by me for Food Fanatic. I love adding malt to cookies! But it’s been far too long since I have done so. Thanks for the reminder. 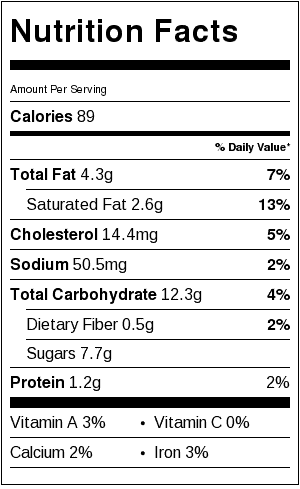 Malted is a new flavor for us, they look great.